Creating a new business is always an ordeal. You have to think about all the little details and plan everything through. 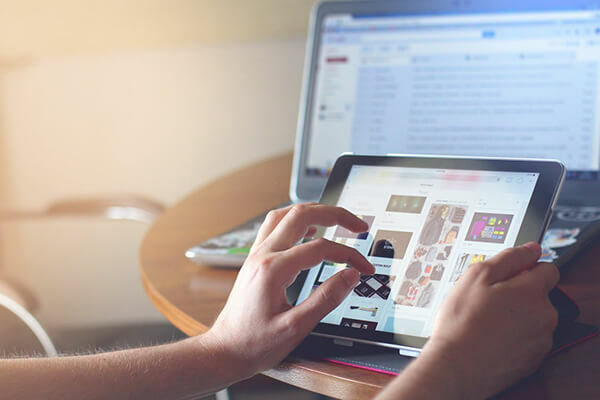 When it comes to putting together a marketing plan for your new business, you will quickly realize that you’ll need more than just good ideas — you’ll need resources as well. Even if you are intending on creating an online shop, you will still need digital assets. However, digital assets like high quality photographs are not that easy to come across. Photographers are expensive, so if you lack the resources you will have to find other alternatives. 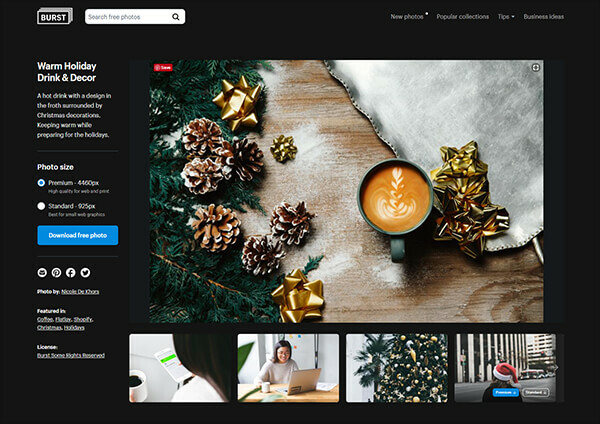 Luckily for you there are many out there, and today we are going to highlight you one of the best free stock photo databases. It is not easy to find stock photos that are good enough to use, especially for free. Most stock photos come with a certain watermark and it’s rare to come across some great visuals. Burst by Shopify is not like this. 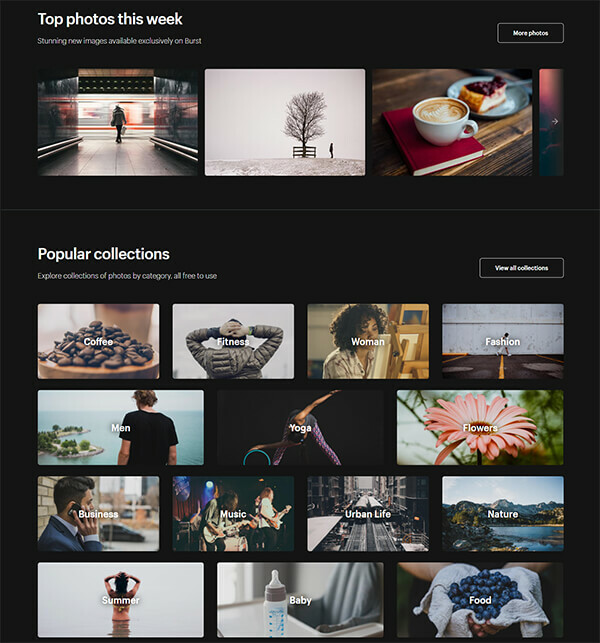 The website offers you thousands of free photos that are both high quality and free. The pictures available on Burst can be used by everyone, from developers and designers to entrepreneurs and bloggers. With Burst by Shopify the artists also receive credit, which means that you can see more of their work and even thank them if you decide to use their photographs. This way you can also rest assured that the photos are not stolen from someone. Ideally, you can also mention the artist or post a link to the original photo page. How do you find and use a photo? Burst offers you plenty of photos, but the site is still new and evolving. More photos will be added in the future, so do not be afraid if you can’t find everything you need. You will see some recommended keywords and you can search for more yourself. 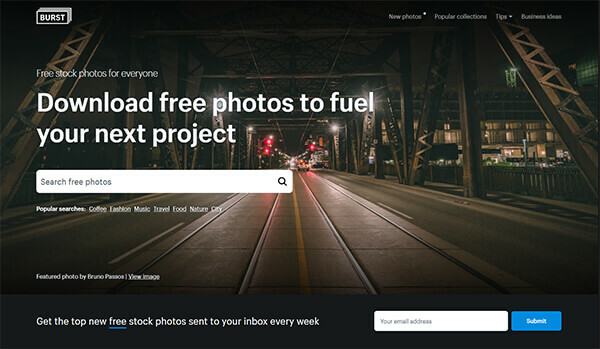 You can also choose to receive the newest stock photos right in your inbox if you submit your email address. Once you find a photograph that you want to use, all you need to do is click on the “Download Photo” button that appears once you open the photo. The picture will be saved in your computer and you will be able to use it right away. You can also download more photos if they are part of a collection. In order to do that simply click “Download Photo Kit” after you open a Business Idea page. You can edit the downloaded photos any way you want and that includes placing your own logo or brand on them. The site also allows you to use your photographs for other kind of offline campaigns such as flyers or posters. If you are a photographer that wants more visibility you can also submit your photographs to Burst as long as they are high-resolution ones. Burst is currently looking for pictures with various subjects, including animals, people or nature. If you think that your photograph could be used by a designer, a developer or someone else, you can send them over. Unusual Hats Show: Crazy or Creative?